The Haida Gwaii Management Council (HGMC) is responsible for determining the Allowable Annual Cut (AAC) for Haida Gwaii. The AAC is the total amount of timber that can be harvested per year from the timberlands (excluding fee simple lands) on Haida Gwaii. 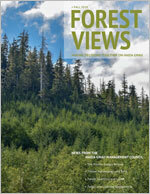 The new 2012 AAC determination was the first Timber Supply Review to be undertaken for the whole of Haida Gwaii. This new determination is consistent and accounts for the new 2010 Haida Gwaii Legal Land Use Objectives Order. The AAC also accounts for all recently protected Haida Heritage Site/Conservancies, Ecological Reserves, Parks and ecological areas. This was the first time that any decision body has been given the authority, by the Haida Nation (Haida Gwaii Stewardship Act) and by BC (the Reconciliation Act), to undertake a decision that was previously made solely by the Chief Forester of BC. Following the HGMC’s AAC determination, BC’s Chief Forester allocated to the existing forest tenures (two Tree Farm licensees, one Timber Supply Area) the amounts of timber volume that may be harvested from each of these areas, based on the 2012 AAC determination.